Each of us is born with a specific plan for our lives, and given specific gifts to do it. And yet, how often do we find ourselves envying our neighbours talents? "She sings better than me; he is smarter; she is better looking; he is more eloquent…" and so on. The first poverty which we must embrace in imitation of Christ’s poverty is the acceptance of ourselves and God’s designs. The foundation of this acceptance is trust—trust that God designed me for a purpose, which first and foremost, is to be loved by Him. It is also accepting that I am poor in virtues and holiness, a sinner in reality, totally reliant on the riches of God’s mercy. Of myself, I am incapable, and so pray, "Lord, have me mercy on me a sinner." This poverty has a face: it is called humility. IN the Second Joyful Mystery, Mary sets off to assist her cousin Elizabeth who is also expecting child. Scripture says that Mary stayed there "three months." The first trimester is usually the most tiring for women. The rapid development of the baby, changes in hormones, all the emotions… and yet, it was during this time that Mary impoverished her own needs to help her cousin. The authentic Christian is one who empties himself in service for the other. This is the most powerful form of poverty. It’s face is that of love. WE contemplate in the Third Joyful Mystery that Jesus was born in neither a sterilized hospital nor a palace. Our King was laid in a manger "because there was no room for them in the inn." And Joseph and Mary did not insist on comfort. They did not seek out the finest, though they rightly could have demanded it. They were satisfied with simplicity. The authentic Christian’s life should be one of simplicity. One can be wealthy, and yet live a simple lifestyle. It means living with what one needs, rather than wants (within reason). Our closets are usually the first thermometer of simplicity. Neither does simplicity mean having to live in squalor. I am certain that Joseph cleaned out the manger, that Mary lined it with a clean cloth, and that their little quarters were tidied as much as possible for Christ’s coming. So too should our hearts be readied for the Savior’s coming. The poverty of simplicity makes room for Him. It also has a face: contentment. In the Fourth Joyful Mystery, Mary and Joseph offer a pair of birds. In their poverty, it was all they could afford. The authentic Christian is also called to give, not only of time, but also of resources—money, food, possessions—"until it hurts", Blessed Mother Teresa would say. As a guideline, the Israelites would give a tithe or ten percent of the "first fruits" of their income to the "house of the Lord." In the New Testament, Paul does not mince words about supporting the Church and those who minister the Gospel. And Christ places pre-eminence on the poor. I have never met anyone who practiced tithing ten percent of their income who lacked anything. Sometimes their "granaries" overflow the more they give away. The poverty of sacrifice is one in which we view our excess, less as play money, and more as "my brother’s" next meal. Some are called to sell everything and give it to the poor (Mat 19:21). But all of us are called to "renounce all our possessions"—our love for money and love of the things which it can buy—and to give, even, from what we do not have. Already, we can feel our lack of faith in God’s providence. Lastly, the poverty of sacrifice is a posture of spirit in which I am always ready to give of myself. I tell my children, "Carry money in your wallet, just in case you meet Jesus, disguised in the poor. Have money, not so much as to spend, as to give." This kind of poverty has a face: it is generosity. EVEN having the Son of God as your child is no guarantee that all will be well. In the Fifth Joyful Mystery, Mary and Joseph discover that Jesus is missing from their convoy. After searching, they find him in the Temple back in Jerusalem. Scripture says that they were "astonished" and that "they did not understand what he said to them." The fifth poverty, which may be the most difficult, is that of surrender: accepting that we are powerless to avoid many of the difficulties, troubles, and reverses that each day presents. They come—and we are astonished—especially when they are unexpected and seemingly undeserved. 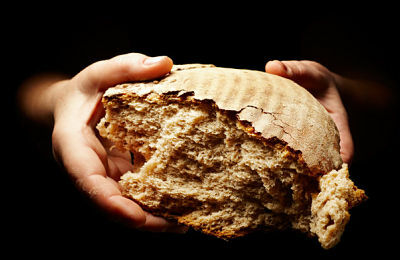 This is precisely where we experience our poverty… our inability to understand the mysterious will of God. But to embrace God’s will with docility of heart, offering as members of the royal priesthood our suffering to God to be transformed into grace, is the same docility by which Jesus accepted the Cross, saying, "Not my will but yours be done." How poor Christ became! How rich we are because of it! And how rich the soul of another will become when the gold of our suffering is offered for them out of the poverty of surrender. The will of God is our food, even if at times it tastes bitter. The Cross was bitter indeed, but there was no Resurrection without it. The poverty of surrender has a face: patience. Those who are well do not need a physician, but the sick do. Go and learn the meaning of the words, I desire mercy, not sacrifice. I did not come to call the righteous but sinners.